Are you struggling to access vital business data locked in your company's on-premises systems like ERP? In this webinar, you'll discover how business professionals can easily and automatically connect to data stored in any system, on premises or in the cloud, via CSV files in the cloud to drive seamless processes and better decisions. Hear Michael Wacht and Scott Lasenby from Helm explain how a leading distribution company transformed a key business process, saving their accounting department 300 hours a year. With as much as 30% of total IT budgets being spent outside of IT departments, technical workarounds by the business, also known as "shadow IT", can no longer be ignored. In order to strike a necessary balance between IT control and business-driven efforts, many IT leaders are turning to aPaaS solutions for Citizen Development. Successful implementation of aPaaS hinges on effective change management around people, processes, and technology. In the past 18 months, IT backlogs have risen 29%, and they are slowing down businesses that need to move more quickly. Watch this webinar to learn how you can reduce your IT backlog by 50% in just 30 minutes, while creating a sustainable approach for the future. 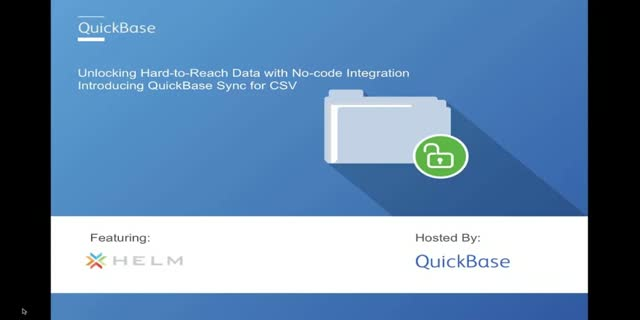 This webinar will demonstrate how low-code Rapid Application Development tools, like QuickBase, can help IT handle the increasing number of requests from business counterparts, enabling them to run faster than ever – and ultimately driving revenue, eliminating costs, and improving operational efficiency. With the tools and techniques presented in this webinar, you will be able to begin drastically reducing your IT backlog in minutes. In a digitally transformed world, technology leaders are being asked to drive greater ROI and innovation, while -- at the same time -- their investments are being more heavily scrutinized for lasting impact. Making one wrong investment can affect an organization for years. With the best practices presented in this webinar, you'll be able to drive transformation not just across your entire team but across your whole organization.